Would close management be best, or should you encourage your people to work independently and deliver a finished product? Different people and different types of projects need different leadership styles. But how do you know which approach is best for each project, person, or situation? In this article, we’ll look at the Leadership Style Matrix, a model that helps you decide. Eric Flamholtz and Yvonne Randle developed the Leadership Style Matrix and published it in their 2007 book, “Growing Pains.” The matrix, shown in Figure 1, helps you choose the most appropriate leadership style, based on the type of task you’re involved with and the people you’re leading. The Leadership Style Matrix is divided into four quadrants. Each quadrant lists two leadership styles that are best suited for a specific situation and person (or group). The Y-axis defines the “programmability” of the task. A programmable task has specific steps or instructions to complete. A non-programmable task is more creative; it’s up to the individual to decide how best to accomplish it. The X-axis describes the individual’s capability and preference for autonomy. Several factors influence this, including education, skill, motivation, and their desire for feedback, interaction, or independence. For instance, a person with a high level of education, skill, motivation and independence is likely to want autonomy. Someone with low motivation and skill will need – and may want – more feedback and interaction, so that he or she can complete the task successfully. To use the model, first look at the Y-axis. If the task must be done in a specific way, or if it has specific steps, then move lower down the axis. If the task is more creative, or if the procedure will change depending on individual input, move higher up the axis. Next, look at the X-axis. If the people you’re leading prefer to work alone, move right on the axis. If they need more instruction and interaction from you, move to the left. The quadrant that you fall into lists the two leadership styles that are most likely to be appropriate for your situation. Let’s look at each quadrant, and the corresponding leadership styles, in detail. Sometimes you’ll be in charge of a task that must be done in a specific way; or that needs to be completed by a team that needs a great deal of motivation, guidance, feedback, or interaction. In these cases, a directive leadership approach is most effective. Autocratic – The autocratic style is sometimes criticized because it seems outdated. This leadership style is authoritative: you issue instructions without explanation, and you expect team members to follow them without question. Although it might seem repressive, this style can be effective in some situations, especially when your team depends on your leadership and feedback, and when the work must be done in a specific way. It’s also effective in a crisis or emergency situation; or when you’re dealing with very significant risks. It’s important to strike a healthy balance when using this leadership style. You need to lead with strength and assertiveness, but it’s also important to lead with kindness. Don’t forget that your team members depend on the feedback that you give them. Praise their good work regularly, and give them constructive criticism on how they can improve. Benevolent Autocratic – The benevolent autocratic style is similar to the autocratic style. However, this approach is more participative. For example, instead of just issuing instructions, you also explain the reasons behind the instructions. To use this style successfully, communicate the reasons why your team must follow your instructions. For instance, explain rules, so that members of your team understand the reasons behind them. When they understand why certain rules or procedures are in place, they’re more likely to follow them. As your team is working, practice management by wandering around so that you’re available to answer questions and provide feedback. This visibility and support will help you keep your project on track and show your team members that you’re there when they need you. When the task that you’re delegating must be completed in a specific way, and the person that you’re delegating to wants to have autonomy in his or her work, you can use either a consultative or a participative style of leadership. Consultative – You use a consultative leadership style when you ask your team members for their input and opinion, but you still have the final say. You consult with the group, yet you’re responsible for choosing the best course of action. To use the consultative leadership style successfully, build trust in your team. When trust is present, your team members will feel comfortable offering their opinions and reacting honestly to issues. Be open to the ideas and suggestions that your team members provide – if you criticize or dismiss your team members’ suggestions, they’ll quickly stop speaking up, especially if they suspect that you’ve already made up your mind. Keep an open mind, and be willing to change your opinion if someone presents a better idea. Participative – The participative leadership style is similar to the consultative style, where you still have the final say in a decision. However, the participative style goes a step further – you depend on your group to develop ideas, not just offer opinions on an idea. The participative style is more about group problem solving and brainstorming. Keep in mind that while you’re depending on your team members for their input, you still need to guide the discussion, you need to communicate goals, and you need to make the final decision. Make sure that everyone on your team understands your role in this process. Here, you’re leading a highly creative project, with a person or with team members who don’t want autonomy. Instead, they need direction, input, and interaction. The two leadership styles that best fit this situation are Consultative and Participative. 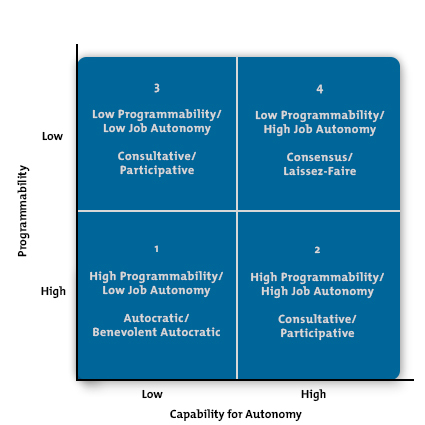 These are the same leadership styles that fit best in Quadrant 2: High Programmability/High Job Autonomy. You fall into this quadrant when you’re assigning a creative – or “loose” – project to a person who wants freedom and independence to work. This means that you need to take a nondirective leadership approach. Consensus – One option is to use a consensual leadership style. Essentially, this means that you’re going to give your team member a great deal of authority in the decision-making process. Instead of being the “boss,” it’s almost as if you become part of the team. Ensure that your team member understands his or her responsibilities when you use this style. Laissez-faire – Laissez-faire is a hands-off leadership style that you should use carefully. You give team members freedom over how and when they’re going to do their work, but you’re there if they need resources or help. You should only use laissez-faire leadership in the right situations, and you should avoid taking this style to the extreme. When you’re working with someone who is highly skilled, motivated, and intelligent, using this leadership style can be very effective. To use laissez-faire successfully, make sure that you delegate the right tasks to the right people. A mismatch between the task and the individual will likely mean that the team member needs additional help from you, and that they may not thrive. This is a useful framework for deciding which leadership style to use for your situation, but there are several other tools that can give useful perspectives. For example, the Hersey-Blanchard Situational Leadership® Theory suggests different leadership styles for individuals with different levels of maturity; and Path Goal Theory looks at leadership styles that are appropriate for different individuals and different situations. Explore all of these before you settle on your preferred leadership style. Eric Flamholtz and Yvonne Randle developed the Leadership Style Matrix and published it in their 2007 book, “Growing Pains.” The Leadership Style Matrix is a simple and useful model that helps you choose the most effective leadership style for your situation. To use the model, first look at the task or project. If there are specific, programmable, steps to follow, move down the Y-axis, but if the project or task is more creative, move up this axis. Next, look at the people that you’re leading. If they want autonomy, move right on the X-axis. If they need instruction, interaction, or feedback from you, move left on the X-axis. Once you have determined the quadrant you fall into, you can choose from the two leadership styles that are most appropriate for your situation.